"We strive to operate a low-cost, effective, and enjoyable bartending program." The history of PSA Bartending Services can be traced back to the early 1970's. During this decade, what was then known as the Bartending School began to prosper at the University of Pennsylvania, and Penn students began learning the tricks of the bartending trade. Over the past four decades, PSA Bartending Services has evolved into an entity that now instructs sixty students every year. 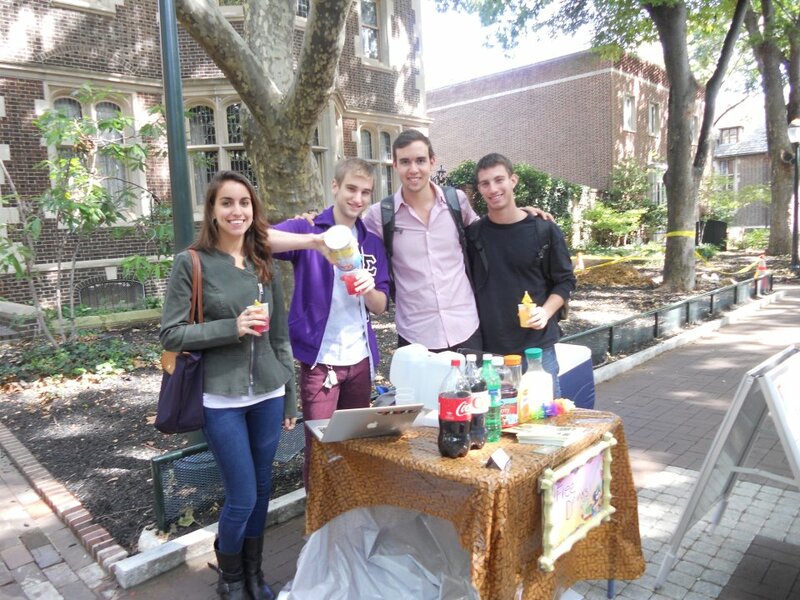 A staff of five undergraduate students comprise the PSA Bartending Services team, and we are housed by Penn Student Agencies (PSA), a non-profit, student-run amalgamation of various businesses. We coordinate and offer at least two instructional and certification courses per semester on Penn's campus. Students who successfully complete our courses will have the opportunity to join the PSA Bartending Services team as a staff bartender and put to use all the fascinating knowledge learned in the courses. Alex demonstrating mixology on Locust Walk. PSA Bartending Services currently employs ten Penn undergraduate students. Jared Fenton has been the PSA Bartending Manager since April 2014 after joining in January of 2013 as assistant manager. He is junior pursuing a B.A. in Political Science and minoring in Hispanic Studies. Eleanor St. John Sutton is the Assistant Manager and is currently in her sophomore year at Penn. She is working towards a B.A. in English and minoring in Hispanic Studies. Ian Skahill, Arabella Uhry, Sean Kelly, Alex Zimmerman, Michelle Lee, and Luis Ferre round out our team and serve as PSA staff bartenders. Jason Mazursky joined the PSA Bartending team in the spring of 2013 to spearhead the development of PSA Tunes, Penn Student Agencies' new branch of musical services. He is currently a senior in the Jerome Fisher Program in Management & Technology, pursuing a BA.S in Computer Science and a B.S. in Economics. We typically offer two to three bartending courses each semester. Our Fall 2015 course date is Saturday, November 21. Do I have to be a University of Pennsylvania student to take the PSA Bartending courses? No, our classes are open to anyone and everyone interested in learning how to bartend! Part of Penn Student Agencies, we are located at 117 Williams Hall, 255 S. 36th Street, on the University of Pennsylvania campus. Do I need a license to bartend? Does PSA Bartending give certifications? The state of Pennsylvania does not offer or require bartending licenses. However, certification from an established professional school will provide you with skills to both find your first bartending job and be comfortable behind a bar from the beginning. PSA Bartending courses provide students with a TIPS (Training for Intervention ProcedureS) Certification, a nationally-recognized certification in alcohol safety and accident prevention. I'm not sure I want to be a professional, but I’d love to learn more about mixology! Then our classes are perfect for you! Our price is low enough for people interested in gaining personal knowledge as well as those looking to find employment afterwards. Can I take the class if I am under 21? Yes, in the state of Pennsylvania you only have to be 18 to bartend! Does PSA Bartending help with job placement? Because we are a student-run agency, all Penn students who graduate from our bartending course have the opportunity to apply to work as a PSA Bartender. How do I hire a bartender? Simply go to our Event Services page and fill out the request form. We will get back to you as soon as possible! How much does it cost to hire a bartender? Our starting rates are $25 per hour per bartender. Who are your bartenders, and how do I know that they are qualified? All of our bartenders are undergraduate or graduate students at the University of Pennsylvania. Each student bartender has taken our Mixology course, completed a TIPS Certification for alcohol safety, and has passed a required bartending exam. Do you provide alcohol or glassware? Unfortunately, PSA cannot provide alcohol, mixers, garnishes, or glassware for events. Our bartenders do come prepared with corkscrew, bottle opener, cocktail shaker and strainer, and speed pourers.